Google is adding new features to Google Flights that will help to predict flight delays sometimes even before airlines report the information. 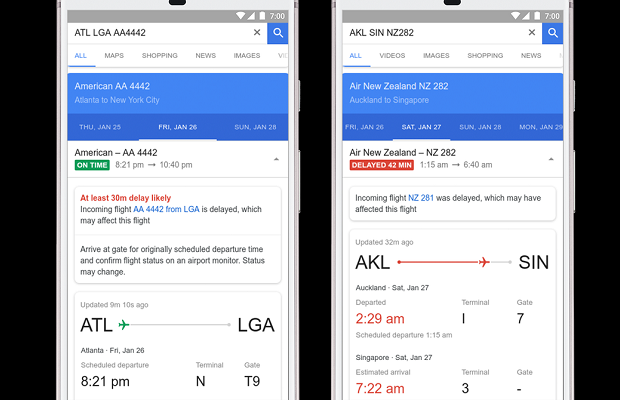 Google Flights already display delays and will now add reasons for those delays and delay predictions, based on predictions from machine learning algorithms using historic flight status data. Using historic flight status data, Google claims its machine learning algorithms can predict delays before information becomes available from airlines. However, it will only flag the possibility of late-running services if the system is “at least 80 per cent confident in the prediction”. To check for delays, passengers can search their flight number using Google Flights, or check by airline and route. Google adds that travellers should still plan to arrive at the airport with time to spare and warns that its predictions should only be used to manage expectations. In addition, the search engine will now show information about what is included in fares displayed for American, Delta and United flights. Google says the function is designed to help passengers navigate new fare options such as ‘Basic Economy’.